For many app developers, TestFlight was a ray of sunshine that offered desperately needed beta testing tools in the early days of the App Store. I remember many developer friends literally asking TestFlight co-founders Ben Satterfield and Trystan Kosmynka to take their money. They haven’t done so yet, but as of today they’re offering even more to developers, thanks to the launch of FlightPath, an analytics platform made for mobile. 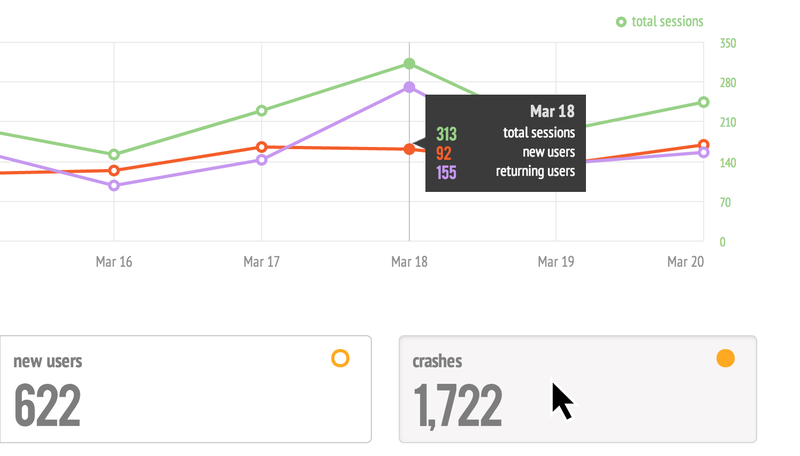 FlightPath is a new entrant in the wold of mobile-first analytics, which includes recent offerings from Mixpanel, Flurry, Keen and others. But the approach taken by TestFlight, and Burstly, the parent company that acquired them in March last year, aims to be different through simplicity and a focus on easy customization. Walking me through the FlightPath dashboard, Satterfield and company show clearly that it’s not only about keeping things on one page, but making sure that the data is flexible and can be instantly manipulated to drill down to specific elements. 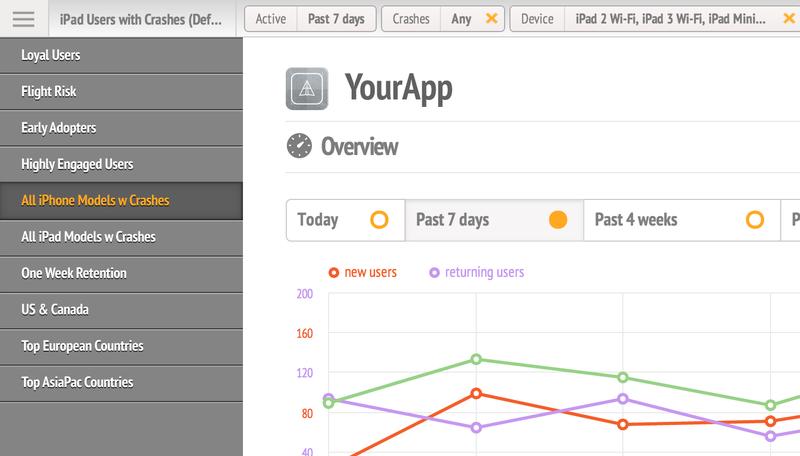 Clicking on any number or graph point in the dashboard automatically updates information, giving you data relevant to that specific piece of your app’s tracked activity. 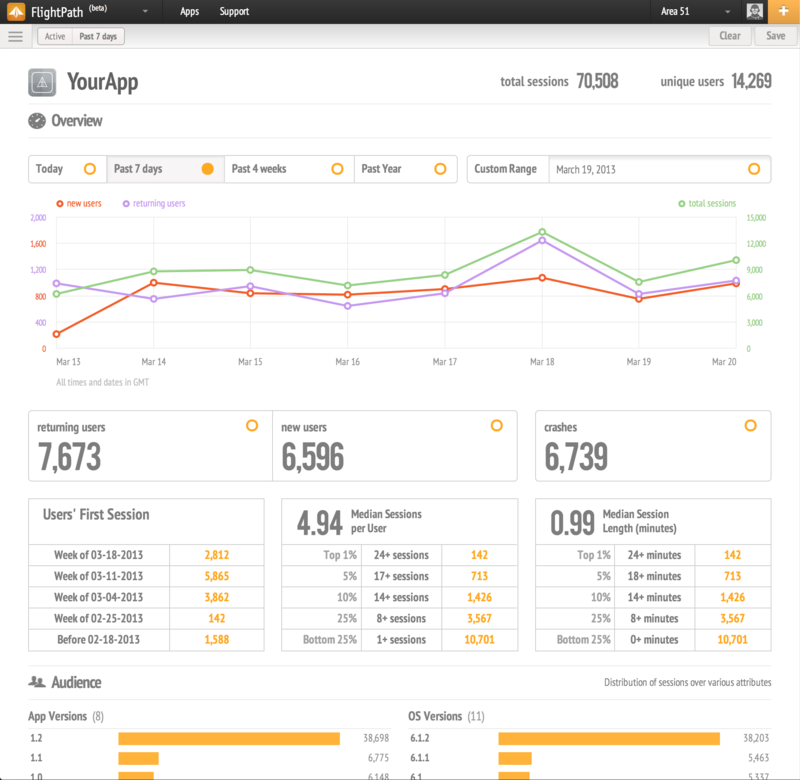 So, for instance, you can look exclusively at users who have signed up after a specific date, see a path analysis of what actions they’ve triggered within your app, and even get a closer look at how frequently something like making an in-app purchase is linked to deeper engagement or further transactions. Specific views can be saved for later recovery, too, making it so you don’t have to tweak and adjust to get at drilled down information that you find particularly interesting. And FlightPath will also come with some preset configurations built in, so that you can easily see segments like your most-engaged users, those who are at risk of abandoning your app altogether, crashes broken down by device model and more. Maybe the best part of FlightPath though is that it’s incredibly easy for existing TestFlight users to get running. The beta product launches today, and TestFlight and Burstly will be choosing participants for that pool from existing TestFlight users, who already have everything they need to get started if they have the TestFlight SDK installed in their app. The team says they can start pulling data with a flip of the switch to populate FlightPath from the existing TestFlight SDK. That said, FlightPath and TestFlight will be offered as separate products, the company explained, since they don’t want to handcuff anyone who wants to use one to the other. Nonetheless, they work together in a very complimentary manner, and TestFlight’s existing devoted following provides a good starting pool of potential FlightPath users. One of the biggest challenges though was living up to TestFlight’s standards, and making sure that it could suit the needs of the incredibly broad range of TestFlight’s existing hundreds of thousands of users. And for now, it’s still free, though the company still says paid plans will be coming soon to cater to high volume users and offer services that enterprise and large shops would be interested in having. The first release is intended to be a starting point for gathering feedback from the pool of test developers, so it isn’t clear yet when FlightPath will release to the general public, but even at this stage it looks like something that will appeal to a lot of mobile developers.